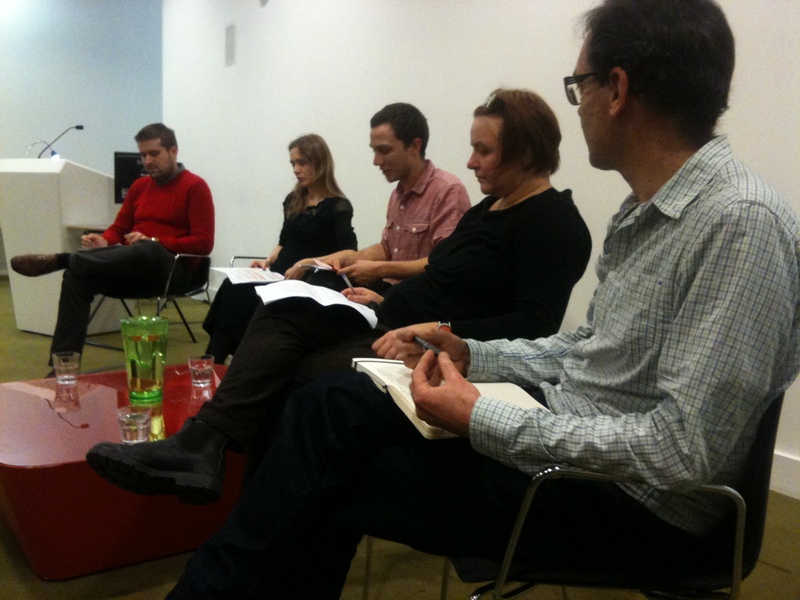 ← Design Culture Salon 6: How do new food systems impact on our towns and cities? L-R: Matt Skinner, Alma Clavin, Gabriel Wulff, Doina Petrescu and Andre Viljoen. Introducing the sixth Design Culture Salon, our chair for the evening Gabriel Wulff stated that from ‘guerilla gardening’ to ‘urban bee-keeping’, the topic of designing food systems has been building an audience in the UK. This was clearly visible in the high numbers who had turned out to talk about ‘food and the city’. The fact that it was a) raining and b) Friday night at the peak of the party season, made this full, lively attendance all the more encouraging. For someone coming from outside the topic, as this writer is, the field of food design and urban agriculture is a fascinating one because it cuts across so many other disciplines, including design activism, a previous salon topic, and more broadly, politics, economics, geography and health. For those working in the field, the salon discussion was an opportunity to reflect critically on its aims, goals and some of the challenges ahead. To begin, Gabriel Wulff contextualised the field of urban agriculture, which emerged from the economic and industrial conditions of the ‘creative industries’ at the end of the 20th Century. The question he put to the panel was, where do we go from here? Andre Vlljoen, from the University of Brighton, was the first to share his thoughts. Reflecting on his collaborative work with architect Katrin Bohn he stressed the importance of visibility in approaching strategies of urban food production. He said that they had started their work by thinking about what cities would look like if you started to introduce food to them. Both bottom up and top-down approaches are required and, crucially, the two need to work together. One without the other wont work for a ‘productive urban landscape’. He spoke about space as one part of a bigger equation: other parts of which are inventories of urban capacity, managerial skills and understanding of how spaces run in the long term. Andre also emphasised the importance of being responsive. There was an assumption for instance, in the early years of his work, that most of the work on urban agriculture would take off on the ground, but there has been a lot of activity on the rooftops recently. The challenge, he suggested, was in convincing people that these spaces are part of an essential infrastructure. Otherwise, they will never gain traction and always exist on the peripheries. Doina Petrescu is a leading figure in academic discourse in urban agriculture, but this evening she spoke directly from her experiences through the Atelier d’Architecture Autogeree (AAA), self-initiated community gardens projects in disused urban spaces in Paris. The starting point, she stated, is about claiming the space. Many of these projects worked within mobile and temporary tenses, where they worked as a trigger for addressing other questions- ‘to initiate collective strategies and move forward collaborations to re-invent the commons’. In this sense, she brokered one of the major themes of the evening, which is to say that food is a currency through which to address something else. If urban agriculture is a form of co-production, Petrescu argued that this production is not about quantities of food, but social capital and wellbeing. From this perspective, food growing can be seen holistically as part of a wider resilience strategy. For these reasons, work in this field constitutes a new form of professional practice, combining elements of social work and public relations. Alma Clavin has been researching urban food growing for eight years. She currently works for CPRE, where she helps run the campaign for a more ‘Liveable London’, and her response reflected on this work as well as her broader research. There can be a perception in cities, she stated, that there is nothing going on locally, no space for creativity and that people sometimes see food growing initiatives as middle class initiatives that are not inclusive. Like the previous speakers, Clavin described urban food growing as an opportunity to address bigger issues relating to politics. Fundamentally, she argued that practice in this area builds on lived experience around the individual and works with tacit knowledge. She highlighted a number of challenges in the field. For instance, there are now almost 2000 community gardens in the UK and over 300 food growing spaces in Northern Ireland- this is significant growth since she started work in 2005 — but she warned, activity can peter out. How do we maximise transformational capacity of food growing? Clavin felt the answer might lie in overcoming binaries (local/global; fast/slow food; urban/rural) and thinking more about relationalities in designing, developing and planning our food growing systems. This might also involve thinking beyond stereotypes of the planner and the developer. Matt Skinner, project leader at FutureGov’s Casserole Club, had just returned from Melbourne where he had been discussing the possibility of running a pilot scheme there. His response made a valuable contribution by opening the subject up to a wider view of how designing food initiatives can impact our cities. The aims of the Casserole Club, a voluntary food-sharing initiative, are to tackle some of the issues raised by the panelists: reducing isolation, facilitating inter-generational relationships and reducing food waste. He described how one of the major challenges of the project, interestingly, was in finding diners, not cooks (they now have 3000 cooks registered in the UK). While ‘foodie culture’ in Britain has created ripe conditions for people to share recipes and cooking stories online, diners, most of whom are aged over 70 and are socially isolated, are not well-connected to this. Technological, as well as cultural barriers need to be negotiated. It has been key, therefore, to work with local councils in addressing these issues of isolation. Skinner positioned the project alongside others, including the Incredible Edible project. ‘What we are learning from this and other projects’, he stated, ‘is that food, in particular home-cooked and home-grown food, is a powerful tool for bringing people together’. Again, the visibility of these projects was stressed as a factor in their success, whether through online platforms or in physical spaces in the city. By this point, it was clear that all four panellists were talking about food as a currency for participation and Gabriel Wulff asked the panel to elaborate further on the dynamics of this participation. What need does it respond to? Petrescu suggested that the movement was a symptom of the need to do things collectively, a method of claiming space and finding a social norm, especially in the environments she had worked in, where unemployment levels were high. Interestingly, Andre Viljoen argued that participation is important but it is not the only way. The reasons for thinking and making productive urban landscapes is not always about the social, but is also about the environmental and can also be political. There were quite a few architects and design practitioners in the room, and many asked about the implementation of these projects. As one put it, ‘food is a good idea- but how do I use it?’ The panel described the process of working with local authorities and identifying the right people as key elements in the process. But, as Doina Petrescu reminded us, these things take time for good reasons. In many instances it is about building a culture and this, clearly, is not a quick or easy process. Other practical questions addressed the issue of commerciality. While many of the practitioners pointed out the notable absence of this word from the discussion, the panelists assured us that this was not the case. Matt Skinner said that one of the earliest discoveries in Casserole Club was that diners did not feel comfortable taking food for free, but equally that cooks would not accept payment. They are beginning to look at the possibility of a ‘rewards scheme’ as a non-monetary method of placing value on the exchange. Doina Petrescu stated that making money was an important output, as long as you are transparent about the kind of system you are running. Another question eloquently addressed the subject of knowledge and memory in relation to food. Knowledge migrates with people moving in and out of cities and also can be lost in generational gaps. How can these gaps be breached? How can young people acquire knowledge about growing food at a practical level? Gabriel Wulff stated that it was important not to be too nostalgic about what has been lost, but rather to appreciate and embrace what is new about working in the field today and build trust in new learning spaces. Many questions focused on the binary of rural/urban which had been partially addressed and there seemed to be some anxiety about the relationship between the two. However, as Andre stated, designing urban agriculture systems has never been about producing enough food to feed the entire city. This is simply not realistic: most people can do some of it but obviously not everyone wants to. Social well-being was another issue that concerned the audience. While Alma Clavin stressed the relationality of this at an individual level, Doina Petrescu argued that she had used time measurements in assessing social well-being impacts, by watching the evolution of people taking on responsibilities and agency within the project. Many participants had initially started by ‘just watching’. Providing the space for this social observation is therefore important. By this point, the salon was running into extra time and there were many more questions being thrown around the room. In answering a final question that neatly addressed many of the evening’s key themes, Gabriel Wulff explained the concept of resilience in relation to food design. Food, he said, stands for something else– it connects us directly to public issues like health and politics. It is visible and relational. It is less about high ideals, he stated, and more about working through issues on the ground. This concluded Design Culture Salon 6 on Food and the City. The next salon is on 10 January 2014 at 7pm in the V&A Museum on the Transparency in Design. Booking is free, but essential. Book here. This entry was posted in Uncategorized and tagged food systems, urban agriculture, urban gardening. Bookmark the permalink. 1 Response to Reflections on Design Culture Salon 6: Food and the City: How do new food systems impact on our towns and cities?